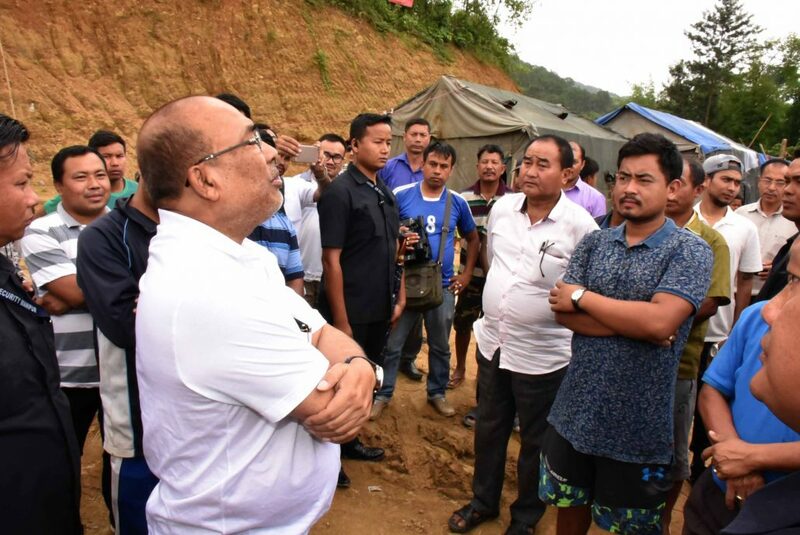 Manipur Chief Minister N Biren Singh on Sunday visited Maiba Khul and Mongjam village in Imphal East District and met the flood-affected people of the area. He also inspected the flood relief camps which are being opened at Maiba Khul Primary School and Mongjam Mamang Leikai. Briefing the media persons, Chief Minister informed that he had a telephonic talk with Union Home Minister Rajnath Singh and briefed about the current flood situation in the State. He had asked the Home Minister to extend immediate flood assistance for the flood victims of the State, he added. The State government has asked for immediate financial assistance for rebuilding the houses of the flood affected people, repair and reconstruction of roads etc immediately, he added. The Chief Minister said that the Union Home Minister has already directed the Home Secretary to provide immediate help for the flood affected people of the State. Singh said that though he couldn’t attend the NITI Aayog meeting due to the current flash flood in the State, however the flood situation of the State would be discussed in the meeting. The Chief Minister mentioned that around 22 houses have been inundated and 120 people have been displaced due to the flood in the Maiba Khul and Mongjam Village in Imphal East district. The District Administration has taken up various measures to help the flood victims in the area. Medical teams are being sent to the flood affected areas. Portable toilets would be constructed in Maiba Khul and Mongjam Village, he added. Chief Minister said that the government is trying its best to control the situation and extend every possible help to the flood victims. Manipur is reeling under flash flood since last few days forcing 58,524 people to stay in 180 relief camps set up at eight districts as the flood water damaged 24,849 houses in five valley districts and two hill districts. According to state relief and disaster management department sources the current wave of flood has claimed seven lives.